Susan Straight's A Million Nightingales is the story of Moinette, a young girl with a white father and an African mother who is sold at the age of 14 to another slave-owner. The novel takes place during the Antebellum era in the old South. 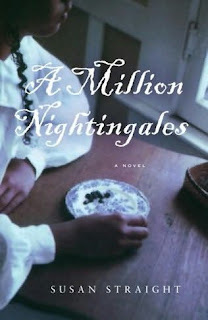 I'm ashamed to say that I discarded A Million Nightingales about mid-way through - I just didn't find it captivating or original, especially when compared to other novels on similar subject matters by Alice Walker and Toni Morrison. Although a wealth of possible plots and stories could be inspired by the Antebellum era, I didn't feel as if this particular "slave-girl" novel was compelling enough to stand out. Straight's style in writing protagonist Moinette's voice is simplified to a degree that allows us to better hear and understand this character; however, the writing is simplified to the point that I failed to see the story as anything other than bland. I know that as readers, using our imagination is part of the job to relate to novels, but A Million Nightingales just isn't lively enough. The pictures painted of Moinette's experiences as a slave are vague and fuzzy, and just not colorful enough to have a major impact. My favorite novel about the Antebellum-era is The House of Dies Drear by Virginia Hamilton. I went through a childhood phase that had me obsessed with anything about the Underground Railroad! My favorite novels by Alice Walker and Toni Morrison are The Color Purple and Beloved, respectively. Click on any of the book images below to see them in more detail on Amazon.com. What are your favorite Antebellum-era novels? What about books on the Underground Railroad? Share your thoughts with us in the comments section below.